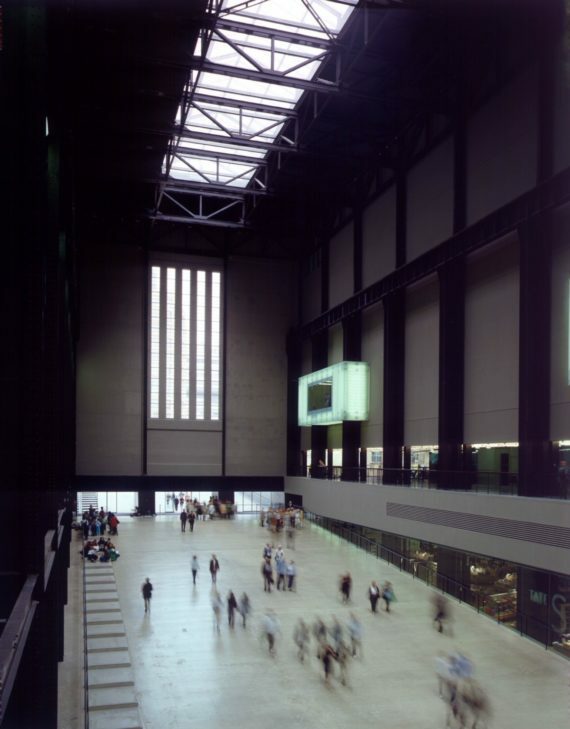 More News In Brief: Tate Modern revealed as the UK's most visited museum in 2018; Jerwood Gallery to relaunch as Hastings Contemporary in July; works by artists including Manet, Picasso and Cézanne temporarily renamed after black subjects for Paris exhibition. Sackler Trust suspends all new donations The move comes after the news last week that the National Portrait Gallery and the Sackler Trust had decided ‘not to proceed’ with a £1m grant for the museum’s building development project. This was followed two days later with Tate announcing it would no longer accept donations from the Sackler family. V&A Dundee has also been urged to give back its Sackler donation, while on Friday South London Gallery revealed that last year it returned a £125,000 award to the Mortimer and Theresa Sackler Foundation, which it had received for the education space in its new Fire Station annexe. In a statement issued on behalf of the Sackler Trust, Theresa Sackler said: “The current press attention that the legal cases in the United States is generating has created immense pressure on the scientific, medical, educational and arts institutions here in the UK, large and small, that I am so proud to support. However, photographer and activist Nan Goldin, who had threated to pull out of show of her work at the National Portrait Gallery if it continued to accept gifts from the Sackler family, said the move was a ‘face-saving’ measure. The Sackler family own the US maker of the drug OxyContin, the prescription painkiller that is at the centre of the opioids public health crisis in America. According to the Guardian, hundreds of thousands of Americans have died of prescription painkiller overdoses in the last 20 years. The Art Newspaper reveals most popular exhibitions and museums of 2018 The UK features four times in the top 10 museums, with Tate Modern at five, the British Museum at six, the National Gallery at seven and the V&A at 10. 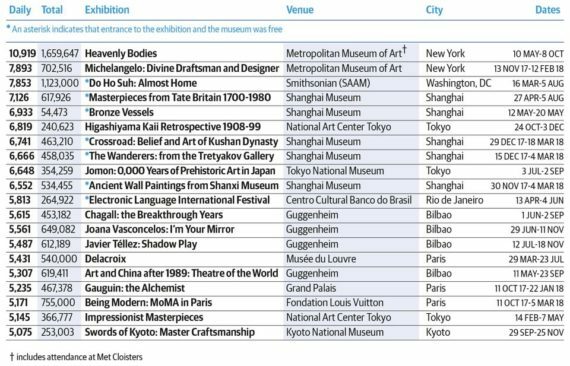 The most popular museum was the Louvre in Paris, followed by the National Museum of China in Beijing in second and the Metropolitan Museum in New York in third. 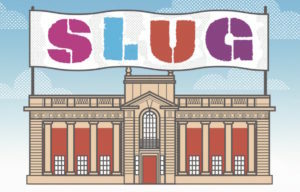 The results mark a drop for the British Musuem, which despite being the most visited museum in the UK nine times over the past decade, was nudged out of the top spot by Tate Modern, which drew around 49,000 more visitors – totalling around 5.9m. The V&A smashed the record it set in 2017 for overall attendance by around 178,000 people, bringing its new record to nearly four million. Despite not making the top 10, the opening of a David Chipperfield-designed expansion at the Royal Academy of Arts to mark its 250th anniversary clearly had an impact. The RA’s popular annual Summer Exhibition, which was guest curated by Grayson Perry, was seen by a record 4,296 daily visitors (296,442). In total, a record 1.6 million people visited the RA in 2018 compared with just over a million in 2017. In terms of the most popular exhibitions, the UK fared less well, not featuring at all in the top 20 shows. The list was topped by the Metropolitan Museum of Art, New York, with ‘Heavenly Bodies: Fashion and the Catholic Imagination’, a Costume Institute show that mixed religious works of art with haute couture. It was seen by nearly 1.7m people (10,919 visitors a day), breaking the Met’s previous record set in 1978 with ‘Treasures of King Tutankhamun’ (nearly 1.4m). The Shanghai Museum, which boasts vast exhibition halls, hosted five of the ten most popular exhibitions last year. This included presentations comprised solely of collections from foreign museums, including a show of works from London’s Tate Britain which attracted 7,126 visitors a day (around 618,000 in total). This was intriguingly the UK institution’s most visited show to date – even though it was 9,000km away from London. Works by artists including Manet, Picasso and Cézanne temporarily renamed after black subjects for Paris exhibition Researchers tracked down the names of the original subjects of the works in ‘Black Models: From Gericault to Matisse’ at Musée d’Orsay. This includes Edouard Manet’s Olympia, a controversial painting of a naked reclining prostitute, which has been renamed Laure after the woman who posed as her black maid. Elsewhere, Marie-Guillemine Benoist’s Portrait of a Negress has been renamed Portrait of Madeleine. 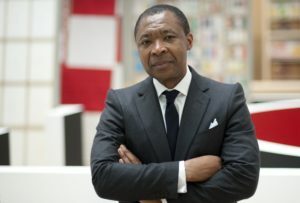 American scholar Denise Murrell told the Guardian that the show reveals the important role black people played in the birth of modern art in Paris, but were written out of the story. She commented: “There was a black presence in avant-garde circles when artists and writers defied convention” when “interracial socialising” was taboo. 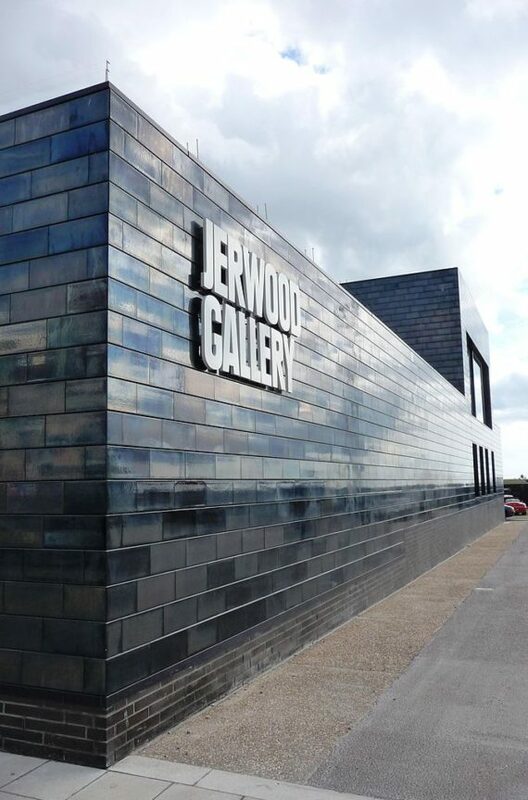 Jerwood Gallery to relaunch as Hastings Contemporary in July The philanthropic organisation The Jerwood Foundation had sponsored the gallery on England’s south coast since it opened in 2012. 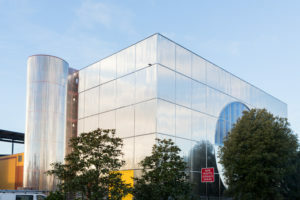 However, it announced plans to terminate its funding agreement by the end of this year, forcing the gallery to give up the Jerwood Collection of almost 300 works of Modern and contemporary British art. Assembled by Alan Grieve, the foundation’s chairman, it included pieces by Barbara Hepworth and Stanley Spencer. Hastings Contemporary will launch with a joint exhibition of works by the Copenhagen-based artist Tal R and the late British painter Roy Oxlade. There will also be a display of new drawings by illustrator Quentin Blake. Future exhibitions include Varda Caivano, Anne Ryan and Victor Willing.